Forklift fleet managers need to stay on top of many different safety issues. From maintaining each forklift to optimum performance levels to keeping track of employee safety training records, there’s never a shortage of items and issues to account for. One area that is often overlooked is handling hazardous waste, and that’s where Hazwoper training comes in. One of the most important guidelines from the U.S. Occupational Safety and Health Administration (OSHA) is their regulations for hazardous waste management, also known as HAZWOPER. CertifyMe.net already provides several OSHA certifications, including the forklift and industrial powered truck training your company needs to meet OSHA HAZWOPER training requirements. Now, our flexible and affordable courses include the latest hazardous waste and material handling methods, all via Hazwoper training online. From 40 hour HAZWOPER training to other safety related instruction and certification, CertifyMe.net has a complete selection of classes for employers and employees. Since OSHA requires that all employers handle their forklift drivers’ training needs, CertifyMe.net is the ideal training solution. Our courses are 100% OSHA compliant, are affordably priced, and we also offer lifetime support! Why HAZWOPER certification is necessary. According to OSHA guidelines 29 CFR 1910.120 and 29 CFR 1926.65, all employees involved with hazardous waste management – including forklift operators – are required to have up-to-date HAZWOPER training. Without 40 hour HAZWOPER training and OSHA HAZWOPER certification, your company is at risk for safety violations, accidents, injuries and more. Don’t put off your safety training another day – sign up with CertifyMe.net today! Who needs HAZWOPER training? All of your forklift drivers involved with jobsite cleanup activities, industrial waste management, and other hazardous waste activities need HAZWOPER training. This isn’t optional – it’s mandatory, and OSHA checks to ensure companies are hiring properly trained personnel. 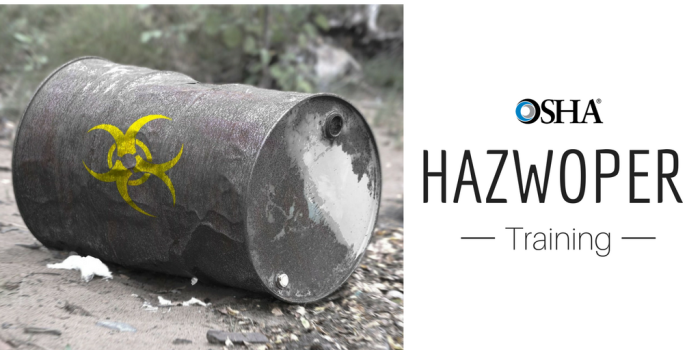 Even if you only deal with hazardous waste activities a few days per year on the job, you need HAZWOPER certification! How it benefits your safety program. For one, OSHA HAZWOPER training means that you’ll avoid costly fines and penalties associated with not having the training. Plus, your safety program will have all of the HAZWOPER safety bases covered, at all times. And that’s important, because hazardous waste management rules and regulations are some of the most constantly reviewed and rapidly changing in the industry – meaning any industry! Let’s look at OSHA’s specific guidelines for hazardous material management and the Hazwoper training requirements. The Hazardous Waste Operations and Emergency Response (HAZWOPER) standard is established by the U.S. Occupational Safety and Health Administration (OSHA). Also known as the HAZWOPER standard, this set of rules is the basis for HAZWOPER safety training. This type of specialized training is for any employee that is exposed (directly or indirectly) to any hazardous substances. Who Must Take HAZWOPER Training? Clean-up operations that are conducted at uncontrolled hazardous waste sites. This work is often done by forklift drivers – moving barrels, bringing in cleanup supplies, etc. Voluntary clean-up operations at sites recognized by federal, state, or local as uncontrolled hazardous waste sites. Forklifts are used for clean-up activities all across the country – that’s why it’s so important you get your HAZWOPER training requirements. Other site personnel, as required. If any of your employees are involved with the aforementioned tasks and duties related to hazardous materials, HAZWOPER training is required – no questions asked! This includes forklift operators; even if your forklift drivers rarely undertake any transport, storage or disposal activities with hazardous materials, HAZWOPER training is essential – not just for your employee’s safety, but to also avoid costly OSHA fines and penalties. Luckily our HAZWOPER training online is all workers need to meet requirements. The HAZWOPER 40-hour course is the most comprehensive type of OSHA hazmat training. Any forklift driver involved with a clean-up operation at uncontrolled hazardous waste sites requires HAZWOPER OSHA instruction. Once you’ve completed this course, you’ll have the proper HAZWOPER certification to handle any hazardous waste cleanup activity with forklifts. Most forklift drivers do not have HAZWOPER training – online, in class, or anywhere. Sign up with CertifyMe.net, and you’ll have all the HAZWOPER training requirements to successfully complete important cleanup projects! Why is HAZWOPER Training Important for Your Forklift Operators? Forklift drivers operate on all types of construction sites and maintenance sites. Not just in new construction, they are often involved in the deconstruction and maintenance of existing structures that can be home to hazardous chemicals and materials. When hazardous building materials like asbestos become airborne, operators and worker are put at risk. They must need to know how to properly take care of and dispose of materials like these to minimize their health risk. How Long is 40 Hour HAZWOPER Training Good For? This training is valid for a period of three years, upon successful completion. All of our training, including OSHA 40 Hour HAZWOPER training, is good for three years. Remember, we also offer free lifetime renewals on our HAZWOPER training and other OSHA safety training modules. With our HAZWOPER training online, you’ll get the upfront service you need, along with the lifetime support that only CertifyMe.net provides! We’re your lifetime HAZWOPER training partner! If your company requires 40 Hour HAZWOPER training, look no further than CertifyMe.net. CertifyMe.net also offers an 8 hour HAZWOPER refresher course to make sure your certification is up to date and you continue to meet all HAZWOPER training requirements. Also check out our a HAZWOPER train the trainer course. For your complete HAZWOPER training online, nobody beats CertifyMe.net. Check out our entire course selection and pricing to get started today! Where can you find all HAZWOPER requirements? OSHA’s own HAZWOPER guidelines are a great resource, and CertifyMe takes care of all of your training needs with a convenient online course. If your company needs HAZWOPER training, look no further than CertifyMe.net. Our forklift training and certification program includes critical safety concepts, OSHA-compliant instruction and – perhaps best of all – an affordable and effective way to ensure all of your forklift operators are fully trained at all times. And with free lifetime renewals, your HAZWOPER certification will never lapse. To get started with your HAZWOPER OSHA training today, check out our forklift training and certification page, or call our HAZWOPER training consultants directly at 888-699-4800. CertifyMe.net looks forward to meeting all of your company’s HAZWOPER certification needs! Along with our HAZWOPER certification, CertifyMe.net has a complete assortment of affordable, accessible, OSHA compliant training courses for your entire forklift training needs. Check out our pricing and course offerings here! Thanks for considering CertifyMe.net for your HAZWOPER certification requirements.